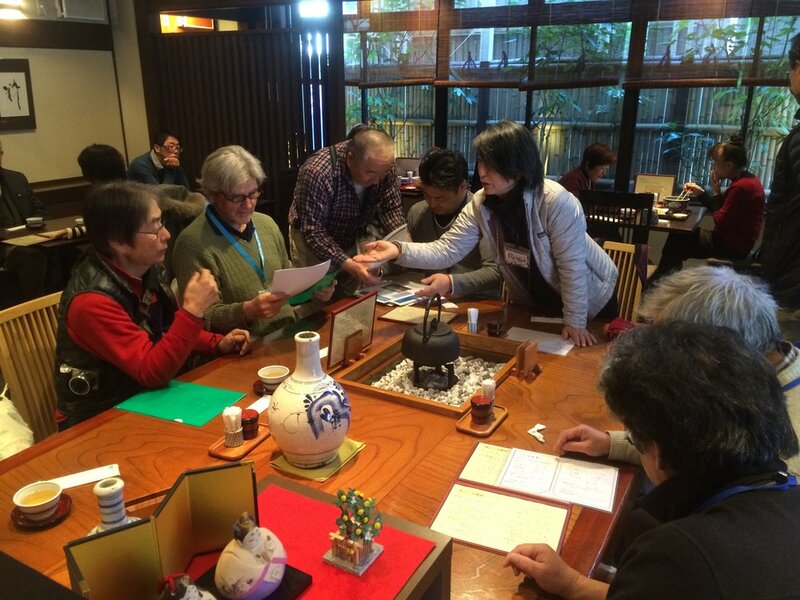 During last winter (2016), I spent most of February and early March in Japan working with and speaking to citizens, refugees, community leaders, elected officials, engineers, doctors, and scientists. At their request, I taught scientists and citizen scientists how to collect accurate radiation data, and also spoke to many groups of Japanese eager to learn about the scientific and engineering hazards of operating 50 nuclear plants in the most seismically active country in the world. The scientific impact of the triple meltdown at Fukushima Daiichi is an ongoing disaster that was never envisioned by the engineers who created and designed these atomic reactors and countries who built them. Even after Three Mile island (March 26, 1979) and Chernobyl (April 26, 1986) no country in the world with nuclear power reactors was prepared for the explosive radioactive contamination of Fukushima Daiichi. Over and over, people ask me about what happened inside the plants and what is still happening inside with robots fried by radiation, corium that can’t be found, and massive amounts of radioactivity migrating to sensitive estuaries, aquifers, contaminating all the ground water, and polluting the Pacific Ocean. For me the most distressing observation now is not what happened six years ago on March 11, 2011 – during and immediately following the meltdowns, but the progressive and devastating impact on real people. While I was in Japan and Maggie was in Vermont, we had a series of phone calls that Maggie taped and the Fairewinds crew turned into podcasts. I urge you to listen these short podcasts in which I share stories about the victims and refugees I met and spoke with. These are real people who have lost their families, communities, health, and homes. Listen to their stories in these podcasts listed here. Now, another year has passed. Radiation continues to bleed into the Pacific Ocean. No one has discovered where the nuclear cores have disappeared to. The $400,000,000 “ice wall” continues to leak. 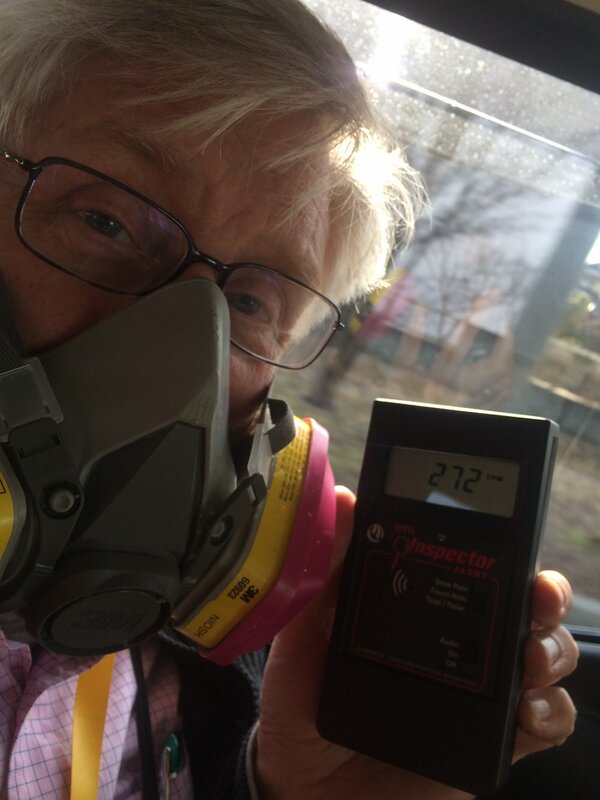 Radiation invades almost everything in Fukushima Prefecture as well as communities in other prefectures that are considered ‘clean’, and residents are rightfully afraid to return home. Moreover, the cover-up continues, with the health effects from radiation being camouflaged as stress related illnesses thereby masking important scientific information. Nuclear corporations in Japan, in collusion with the Japanese government and banks, are still trying to recover their financial assets by attempting to restart old atomic power plants, even though a majority of Japanese want those nukes to stay closed. 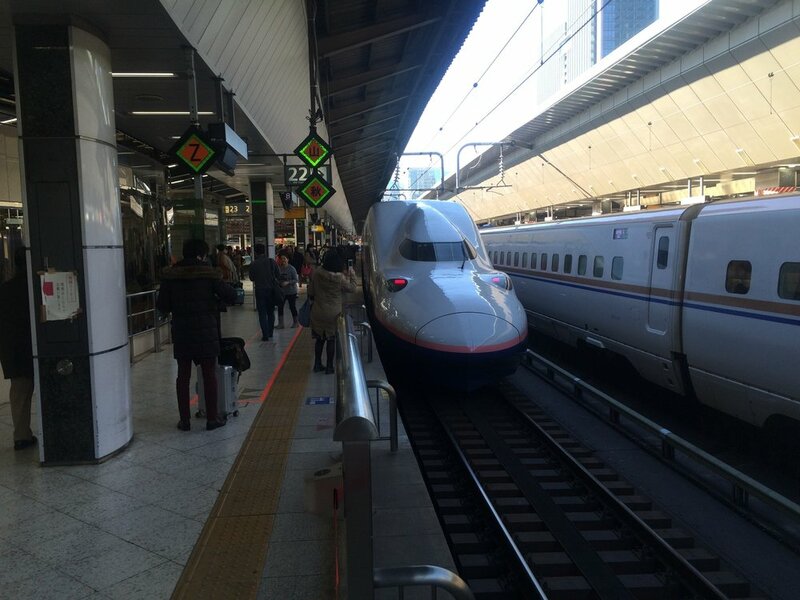 Bullet Train. 180mph, quiet, fast, smooth, and on time! Research Team meets to plan radioactive sampling program.. and eat good food! Contamination is everywhere. This is on a public street used by school children. Measuring radiation in bathroom vents. Taking dust samples underneath floor matts at a convenience store. Proves radiation is being spread everywhere. Radioactive rubble on public road. I saw a young girl ride a bicycle over this moments before. Radiation next to a driveway of a house where people were still residing. Measured 5.618 micro Sieverts/hour. 50x the normal background. 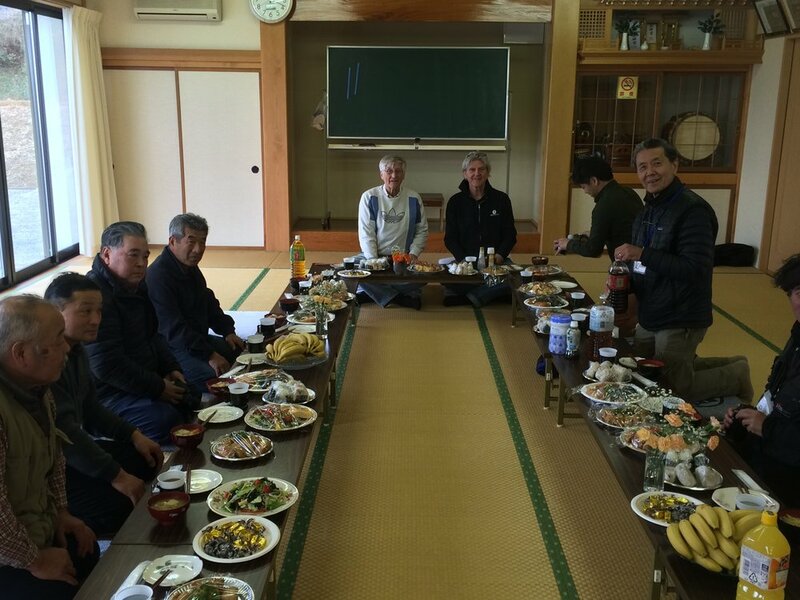 Sharing a lunch with local officials. They shared their personal stories from the disaster, feeling the blast wave, and being personally irradiated. Buddhist monk at the Soma Family Temple. Without an introduction he reached out his hand and said "I know you, you're on YouTube!" Uncontaminated Shrine on Japan's west coast. Genbaku Dome was the only building to survive the atomic bombing of Hiroshima, although all those inside died of radiation. After the bomb hit, the river was filled with bodies. One of many lectures I gave explaining the risks of nuclear power. Bags of radioactive material in background. Sign says "decontamination is still in progress." Glad I had a good respirator. From this Photo forward, I was allowed to enter the area, but nobody lives here as the land is uninhabitable. One of many piles of irradiated debris that young workers have cleaned up. One of many solar powered radiation detectors on the side of the road. Normal background radiation is 10x lower. Old cemetery for ancestors. New nuclear waste incinerator. 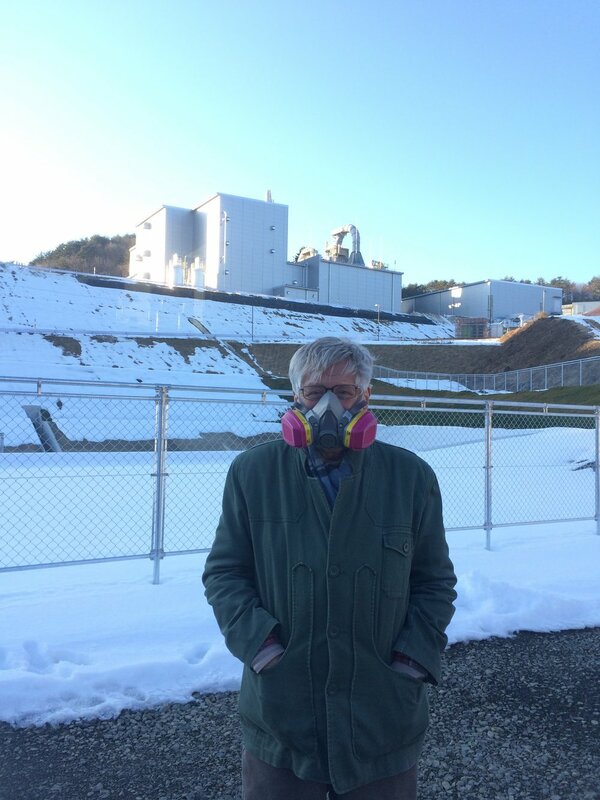 Wearing my respirator in front of the nuclear waste incinerator. Radioactive debris being transported through a ghost town to one of many dumps. Abandoned building blocked off from the road. Eerily quite throughout town. Driving through contaminated town. Windows up. Normal background radiation is more than 10x lower. Love that respirator! Abandoned town being taken over by weeds. Roadside Buddhist shrine to the victims of the tsunami. Fukushima Daiichi way in the background. Blue guardhouse checkpoint on highly contaminated road. Guardhouse is lined with lead to protect the guard. 30x normal background radiation at entrance to tunnel. 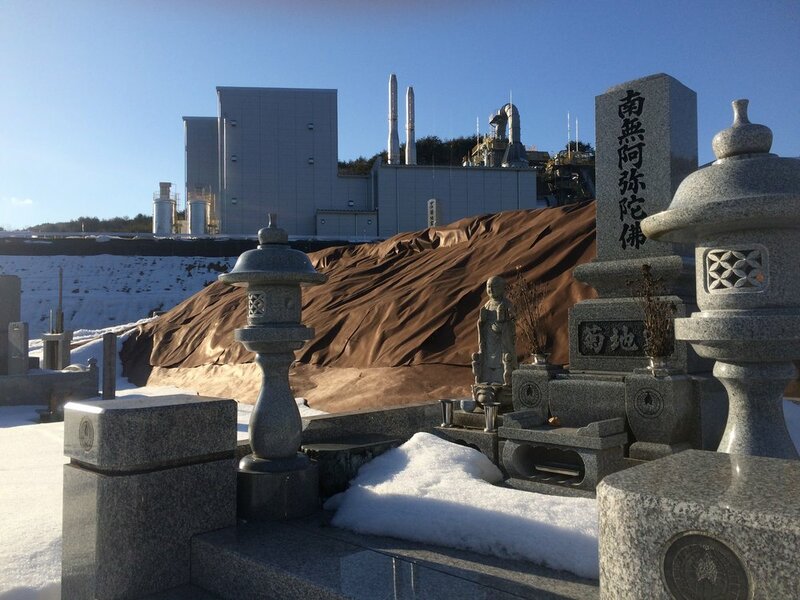 Radioactive debris piles keep on growing. Abandoned phone booth near a train station. The last call was placed march 11th, 2011. 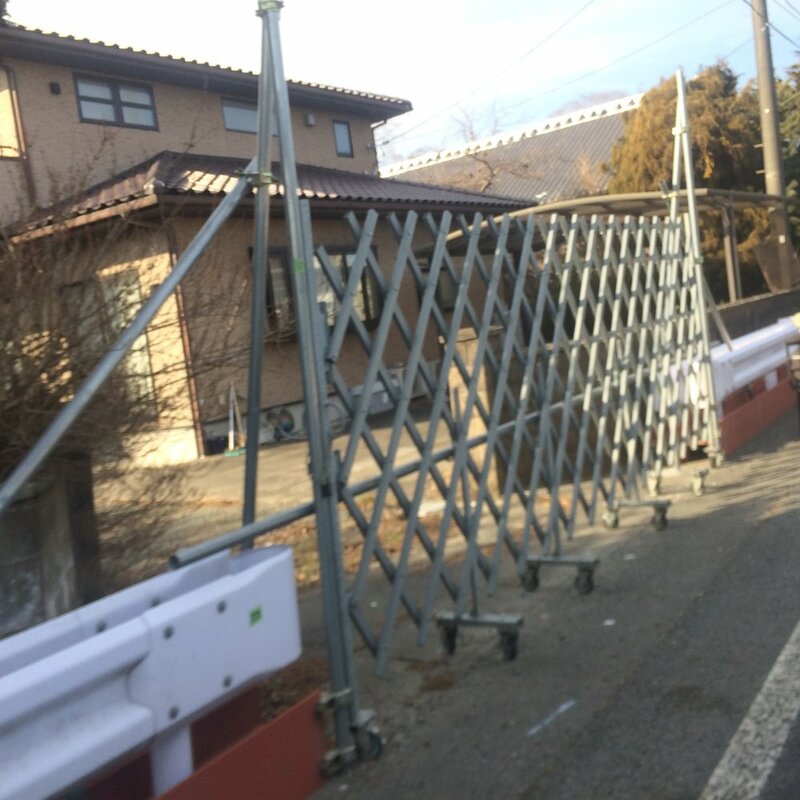 Nothing is changing near Fukushima Daiichi on this sixth anniversary. I decided to share the photographs I took last year in Japan for the commemoration of the sixth year. These photos are not the cherry blossoms and once beautiful farmland of the heavily agricultural Fukushima Prefecture. In fact these photos cannot adequately convey the scientific and human impact of the worst industrial cataclysm in the history of the world. Everyone knows when the Great Tokohu Earthquake struck and the Fukushima Daiichi meltdowns began. And, because some of the radiation will remain for 300 years and other radioactive isotopes will be extreme hazards for 250,000 years, of course no one knows when it will end. PS - Special thanks to all the people who crowd-sourced my trip to Japan and made the trip possible. Thanks to the individuals and groups in Japan who hosted me, sponsored talks and meetings and shared their lives and plight with me. Thanks also for the personal donations to Fairewinds Energy Education to cover my flight to Japan and the teaching equipment I used while I was there. More news and data will be released in 2017 as the scientific analysis is confirmed by other experts. At Fairewinds Energy Education, we will keep you informed.